EDC Las Vegas 2017 brought more than 400,000 together Under the Electric Sky in Las Vegas for another unforgettable weekend. After 21 years Under the Electric Sky, it’s safe to say that Insomniac’s Electric Daisy Carnival has secured itself as one of dance music’s most iconic events. This year’s edition of EDC was bigger and better than ever. From Friday, June 16 through Sunday, June 18, EDC Las Vegas brought hundreds of DJs and performers to the Las Vegas Motor Speedway to entertain across more than eight stages. In true EDC fashion, temperatures lingered around a scorching 100 degrees all weekend (even after sunset). All are welcome here at Electric Daisy Carnival—and this year’s motto surely exceeded expectations. The most buzz-worthy and eye-catching of them all at EDC Las Vegas was this year’s kineticFIELD main stage. An elaborately crafted and intricately designed kineticGAIA incorporated a mystical, open-handed goddess at the center with a heart-shaped LED screen below, where the DJ would perform. At each end of the kineticGAIA stage were Insomniac’s signature night owl’s. A mesmerizing and enrapturing entity, this year’s kineticFIELD may have been the most detailed and elaborate since 2014’s kineticCATHEDRAL. Each of the stages at EDC are never lacking in production quality and wow-factor. This year’s circuitGROUNDS boasted a fully immersive experience with LED screens and pyrotechnics surrounding the crowd from all directions. After ditching its typical open-air, hangar-style tent in 2016, circuitGROUNDS nearly serves as a second main stage at Electric Daisy Carnival. Encompassing nearly 2,000 moving lights, 40 flame units, 1,200 pyro units, circuitGROUNDS was an adventure within itself. From the biggest names in dance music to up-and-coming, breakout DJs, the wide range of talented formers and entertainers is what keeps the diversity alive among its eclectic yearly lineup. From mainstream EDM to techno, trance to bass, hardstyle to dubstep, progressive to electro, EDC’s got you covered! Explore new music, come together with likeminded Headliners, escape from reality, embrace the moment, experience Electric Daisy Carnival. Day one highlights included the first sighting of the kingdom of the kineticGAIA. The unveiling brought dusk till dawn sets from Armin van Buuren, Martin Garrix, Hardwell, Afrojack, Andrew Rayel, GTA, Will Sparks, and more. Friday’s cosmicMEADOW set highlights were Illenium, whose passion was prevalent from start-to-finish, San Holo, chart-topping Major Lazer, Jauz who brought out special guest G-Eazy for a live performance of “Me Myself & I” and paid respect to the late Robert Miles by playing his iconic “Children,” Gryffin, NGHTMRE, and Slushii. More of a techno junkie? neonGARDEN, hosted by Factory93, served up deep sets from techno-greats such as Chris Liebing, Nicole Moudaber, Pan-Pot, Green Velvet, Jaime Jones presents Paradise, John Digweed, Lee Foss, and Adam Beyer presents Drumcode. The notorious neonGARDEN tipi returned with the fan-favorite piece, a giant disco ball hanging from the center. What else went down on day two, you ask? Experiencing whatever else you still had left to explore after getting acquainted with the grounds on day one. From quality cuisine to carnival snacks, nearly two dozen free carnival rides, eight art cars, live entertainers, and art installations, EDC is a man-made neon-city in the middle of Sin City, which comes to life as Headliners fill the space. The fully-immersive circuitGROUNDS is enrapturing, while still completely open-air. Saturday at circuitGROUNDS brought highlight performances from Above & Beyond, Duke Dumont, Alesso, Oliver Heldens, and Alan Walker. Dreamstate returned to EDC this year, but this time with its very own stage, quantumVALLEY. The TranceFamily united in the tent for high-BPM sets from Paul van Dyk, Paul Oakenfold, Gareth Emery, Ferry Corsten, Cosmic Gate, MaRLo, Aly & Fila, Markus Schulz presents Dakota, and John O’Callaghan. The lasers came out to play as trance acts such as Simon Patterson, Sander van Doorn presents Purple Haze, ATB, Bryan Kearney, Ruben De Ronde, Infected Mushroom, Giuseppe Ottaviani & Solarstone, and more, took to the cotton-candy colored tent. On EDC’s final day, Drake joined Metro Boomin at the bassPOD for a medley of favorites, including tracks from his More Life album playlist. Drake’s bassPOD appearance resulted in absolute madness from the crowd, who sang along to “Jumpman.” The set continued, “Can I get some more of this [EDC Las Vegas] tonight?” Drake’s own “Pop Style,” “Gyalchester” “Fake Love” were next on the setlist. Long-time EDC veteran Headliner, Kaskade, also made a surprise appearance this year, performing an unannounced set. bassPOD by Bassrush assured that the bass-lovers got their fix all weekend long as DJ sets rocked the grounds from Datsik, GRiZ, Boombox Cartel, Zomboy, Herobust, and Chase & Status (DJ set), among others. While wasteLAND, hosted by Basscon, brought hardstyle sets from DJ Isaac, Coone, Da Tweekaz, Wildstylez, Noisecontrollers, Brennan Heart, Lady Faith, and more. DJ Khaled took to the cosmicMEADOW stage after his scheduled set time attempting to continue his set during Yellow Claw’s time slot. This inevitably resulted in boo’s from the crowd who began chanting “Yellow Claw” after Khaled made several attempts to win back their affection. 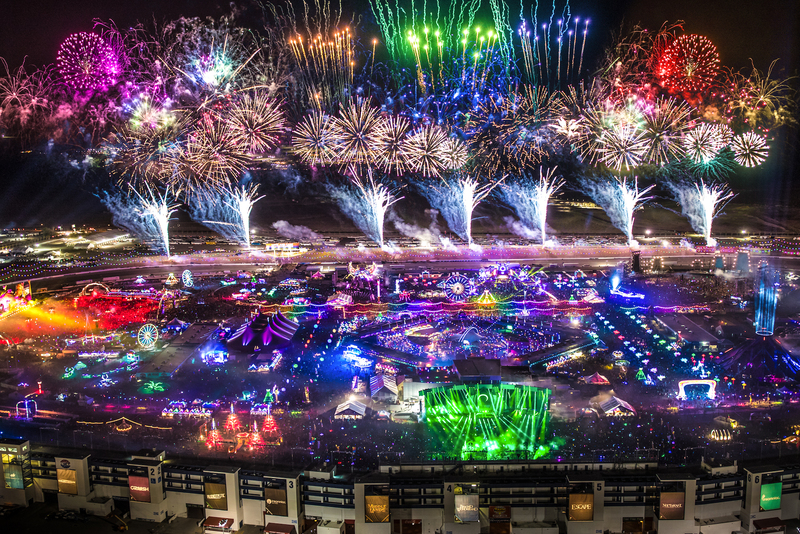 Another new addition to this year’s edition of EDC was the first-ever live stream, presented by Red Bull TV. All weekend long, those unable to attend the Electric Daisy Carnival in person were given a glimpse of the larger-than-life experience with a behind-the-scenes look at each of the elaborate stages. Although Insomniac did not host an EDMbiz this year, the production company and its Founder were honored with a major accolade. In the days leading up to the 3-day carnival, Insomniac Founder and CEO, Pasquale Rotella, was presented with a key to the city of Las Vegas, as well an honorary renaming of Las Vegas Blvd. to Electric Daisy Lane during EDC Week. Electric Daisy Carnival, the largest electronic music festival in North America, lived up to its hype and surpassed its expectations again this year. Electric Daisy Carnival is a movement, and all are welcome here.